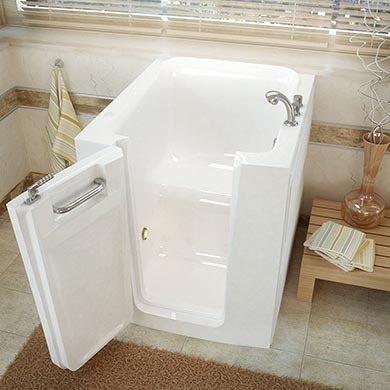 One of the best way to safe haven a senior citizen in their own home is to buy a walk-in bathtub. The tubs themselves are expensive but in the long run, we have to think about how much water does it take to fill up a walk-in tub and how this is going to impact your water and electricity bill. Does water to fill a walk-in bathtub cost 1$, 10$ or 100$? Not to mention that you’ll also probably have to upgrade your water heater. You don’t want to spend $10,000 on a new walk-in tub only to find out you don’t have a big enough water heater, right? According to Home Water Works organization, we use less than 20 gallons of water for a regular shower. Do you know how many gallons of water does it take to fill up a walk-in tub? The biggest tubs have a 100-gallon capacity; that is more than 5 times as much water used than for a normal shower. Pretty much nobody has a 100-gallon water heater already installed at home. The amount of water we use to completely fill a walk-in bathtub depends on the walk-in tub dimensions. The average water capacity of an accessible walk-in tub is typically 60 gallons (according to MySeniorSource) but this number is merely a rough estimate. We have added the measurements with the walk-in tub types but it is recommended that you open our article about Walk-In Tub Dimensions here to better understand what particular walk-in tub we’re talking about. 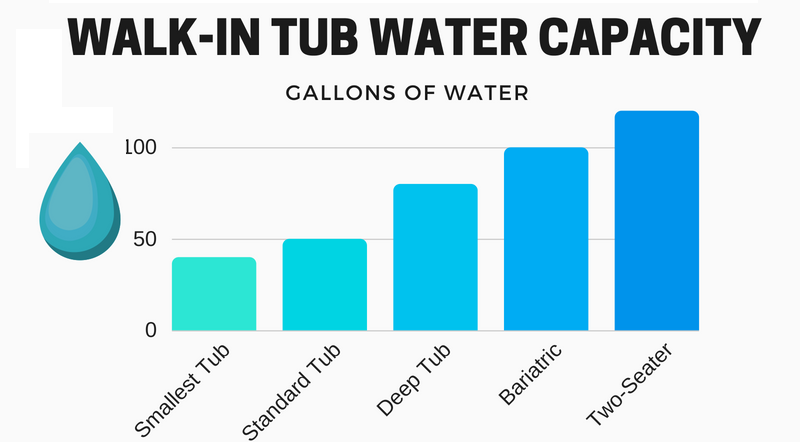 Below we’ll list how much water you need per bath given the 7 most common walk-in tub types and give you some concrete examples of walk-in tubs and water heaters to use with them. Furthermore, we’ll try to roughly estimate how much your monthly water and electricity bill might be affected if you decide to use a particular walk-in tub on the daily basis. How Many Gallons Of Water Does Walk-In Bathtub Hold? Do you have a big enough water heater to fully fill your walk-in tub? If you have a 60-gallon tub and only 40-gallon water heater, you’ll have to upgrade it. How much does it cost to fill the tub with hot water? Considering the water and electricity (for heating up water) prices, you’ll pay much more for a let’s say 100-gallon tub. How long will it take for a walk-in tub to fill up? According to Hunker, the average bathtub faucet water flow is about 5-gallons per minute. That means that it will take 10 minutes to fully fill a 50-gallon walk-in bathtub and 20 minutes for a 100-gallon tub (the flow for walk-in tubs is usually much higher if you upgrade 1/2 inch pipes with 3/4 inch pipes). Body water displacement – this is the amount of water your body displaces when you’re enjoying a bath. For example, if the full water capacity of a walk-in tub is 60 gallons, you will require 60 gallons of water to fill a completely empty tub. However, if you’re sitting in the tub, you won’t need so much water because your body fills the tub as well. According to a quick calculation, the body of a 200-pound individual (fully submerged) accounts for 24 gallons of water. That means you’ll only need 36 gallons of water to fill a walk-in tub. Filling a walk-in tub to the brim – the water capacity from the specifications tell you how much water you need to normally fill a walk-in tub. However, you can pour even more water in and if you fill the tub to the brim, you’ll need some extra gallons of water. Carol Bluestein tells a great story about how she could fit 70 gallons of water in her otherwise 50-gallon walk-in tub by filling it up to the overflow outlet. In short, you can easily subtract 20 gallons of water from the walk-in tub capacity because of body water displacement and, on the other hand, add about 20 gallons if you want to fill a walk-in tub up to the overflow outlet. Below is the list of walk-in tub types and how many gallons of water you need to fill them. Rectangular walk-in tub requires only 40 gallons of water. Canadian Safe Step – their tubs need 50-55 of water to be fully filled. TheraTub – one of their newest walk-in tubs holds as little as 47 gallons of water. As you can see from the walk-in tub water capacity list several types of tub even come close to 100 gallons of water for a full bath. 100-gallon water heater upgrade for walk-in tubs with higher water capacity. Most households have a 40-60 gallon sized water heater. This is usually enough to take our needs for clothes washing, dishwashing and showering. However, a walk-in tub presents a big drain on the water heater and usually the standard-sized heater is not enough to fully fill up a walk-in bathtub. For example, if you have an 80-gallon walk-in tub and only a 60-gallon water heater, you will have to fill your accessible tub with 60 gallons of how water and 20 gallons of cold water. The result, as you might imagine, will be a lukewarm bath that really is not a great way to enjoy a tub. 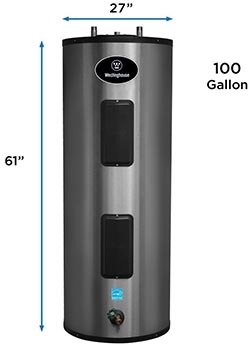 A new 100-gallon water heater costs quite a bit – it is not unusual to spend more than $2,000 on a high-quality heater. On the right, you have an example of a 100-gallon Westinghouse heater that has good reviews on Amazon and costs less than $1,500. Before deciding to get one, be sure to check out the costs of water heater installation. How Much You’ll Spend For Water And Electricity? For a normal walk-in bath, you will need around 50 gallons of hot water, give or take. We can actually calculate how much does it cost to fill walk-in tub per a single bath. All we need is water and electricity price in your particular city. We’ll make this rough calculation for the city of Minneapolis, Minnesota USA (you can check how much a tub full of water costs in your city using some of Circle Of Blue statistics). Here the price of 1 unit of water (748 gallons) costs $3.20. For a single walk-in bath, we need 50 gallons, which equals to about 0.21$. So, just for water, we pay about 21 cents. What about electricity for heating up water? According to an article about heating up water, it costs close to 2 cents to heat up a gallon of water. For a walk-in tub, we need to heat up 50 gallons of water and an estimated cost of heating (electricity) is $1.00. This makes an estimated total for a single walk-in bath of $1.21. If, for example, you want to enjoy a bath every day, this brings the monthly total to $36.3. If you have an experience or story to share about a walk-in bathtub, especially concerning water heaters, water capacity and the costs of it all, you’re welcome to share your thoughts in the comments below.